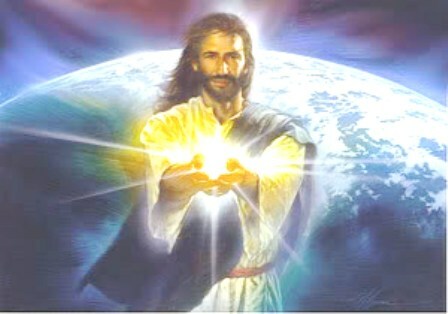 Artist's depiction of Christ, the light [of the world]. Question: Why is Christ described as "light?" The preceding verse [John 1:3] spoke of Christ creating all physical life; but verse 4 speaks of of a life that is so much different. It is a regenerating life; a type of life that transforms the human soul from being enemies of God [Ephesians 2:1;2;3 ; Romans 8:7 ; 1 Corinthians 2:14] to that of being friends with God. [Psalm 23:1f] This regenerating life only happens when Christ the Creator comes with His divine light, not only to expose sin [John 8:12] but to author and pioneer the way out of that spiritual darkness [Hebrews 12:2 ; Hebrews 5:9] which only leads to eternal damnation. John 1:6 - "There was a man sent from God, whose name was John." John the Baptist is now introduced in verse John 1:6. Later on in the chapter it is more fully explained about his role of introducing the people of his day to Jesus Christ, the fulfillment of Old Testament prophecy of Christ, the Messiah. "Bible Questions and Answers" are intended to help assist the web reader to appreciate the Holy Scriptures and to enhance understanding. It is this web author's prayer that God the Holy Spirit will utilize this humble effort to effect and affect faith in those who read and hear. As Pastor emeritus Nathan Bickel has additional thoughts to convey of these specific Bible questions and answers individual published web postings, he will continue to edit - revise and add. Please check back, at will on this website; and / or check with Nathan M. Bickel ['s] Facebook page: The Christian Message for notifications of upgrade. Children of God: By one's own will or His?